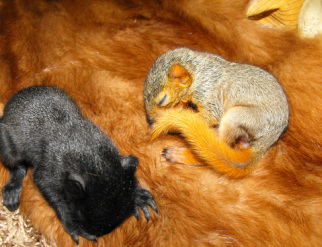 What to do if... - Wildlife Rescue Team, Inc.
- Call WRT as quickly as possible. (402) 473-1951. - Do not give any food or water unless directed by WRT. The wrong food or water can often do more harm than good. Additionally, if the animal is too weak it may not swallow properly and could get water in its lungs. If food is introduced while dehydrated, this can also be deadly. - Do not attempt to remove fishing line or something that may be caught or tangled around the animal. Find an appropriately sized box - not so large that the animal will be able to thrash around and possibly injure itself. Make sure that there are small air holes in the box. Secure the lid and put the box in a quiet place. - If the animal is cold, the box may be placed half on and half off of a heating pad set to low until help is available. If a heating pad is not available a simple empty water bottle filled with warm water wrapped with a towel will do for short periods of time. - The most important thing you can do for the animal is to keep it in a warm, dark, quiet place and transport it as quickly as possible via communication with WRT. - Nocturnal species like raccoons or opossums are active at night, so if you see the adults or their babies out during the day, they might need attention. - Here is more information on when and when not to rescue an animal. Contact WRT for more information and/or to report an injured or orphaned animal.